Our next CCI puppy adventure — coming soon! Once you’ve turned in one CCI puppy (as we just did with Kyndall), what’s the best time to get another one — assuming you’re willing to go through the whole crazy adventure again? Steve and I knew that we were (that crazy). But we were wracked by indecision over the timing. We’ve been traveling more in recent years, and although a virtual army of CCI volunteers stands ready to help with puppy-sitting (for which we’ve repeatedly expressed our gratitude over the years), we sometimes worry about imposing on the puppy-sitters’ generosity too much. Plus, arranging all the puppy-sitting takes time and attention. With a couple of trips on the horizon, we wondered if we should take a break. But, then, what time would ever be better than now? We vacillated. Then we were swept into a decision a few weeks ago at puppy class, when another long-time puppy-raiser (Cyndy Carlton) asked what our plans were for raising again. She also told us, with great excitement, that some “Phyllis puppies” would soon be available. When I asked her what Phyllis puppies were, she gave me some information, but I was still confused. Mainly what I took as the bottom line was: these were likely to be awesome puppies, and we should make every effort to get one when they arrived at the beginning of June. I pointed out that Steve and I wouldn’t even be home then. We’re about to leave on a trip to Colombia from which we won’t return until June 15. But Cyndy brushed that away. 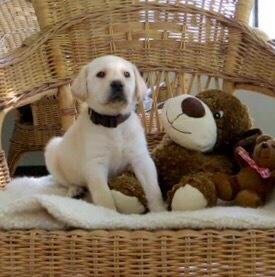 Jan Ford (another veteran puppy-raiser) would happily foster our puppy (should we be lucky enough to get one). I checked, and Jan confirmed this. So, impulsively, I sent an email up to CCI asking if I could apply for one of these magical puppies. Becky Hein, the puppy program manager, warned that she didn’t know if any would be available; she would have to defer to the existing waiting list. But just a week later, we got another email announcing we could get a yellow lab-golden offspring of Phyllis. The pup’s name would be Beverly. So the way things now stand, Steve and I will depart on our trip Saturday (May 28). Beverly will fly down from Northern California next Wednesday, June 1. Cyndy will pick her up at the airport and transport her to Jan (who has a childcare business that she runs from her home). Jan will take care of Beverly until our return on June 15. This all feels so unorthodox to me. It also means we won’t get to experience Beverly when she’s at her smallest and most adorable. On the other hand, I know for a fact that Jan is a truly gifted puppy-raiser. It’s not unimaginable that we might get home to find Beverly already sleeping through the night — and house-trained. That’s probably a pipe dream. I did learn more about why Cyndy and Jan are so excited about the puppies of Phyllis (Beverly’s mother). Phyllis is the daughter of Emerald, an apparently awesome dog whom Cyndy raised. It’s possible that Beverly will be as awesome as her Grand-dam. I hope she is. And no matter what, I’m glad the hope of that coming to pass forced our hand. Last night Lisa returned to pick up Kora, the year-old CCI pup that who’s been living with us while Lisa was off traveling. She didn’t arrive until around 8 p.m., when I think Kora was a little sleepy. When we called Kora into the front room, where Lisa was waiting, she took a few minutes to react. But then she seemed to slowly get overcome with joy. Thoughts of Kyndall have popped into my head with surprising frequency in the three days since we bade goodbye to her. Owning any dog is a responsibility, and taking care of a puppy on the path to a life of service is at least as big a one. We’ve gotten so used to it over the years that it doesn’t feel like a huge burden. But every time one of our CCI dogs suddenly disappears, it takes a while to adjust — to turn off our all-but-automatic caretaking instincts. Now the Big Silence unfolds. We’re not allowed to visit any dog who’s begun Advanced Training. CCI claims that it appears to unsettle them. In a few weeks, we’ll get a formal Graduation Photo. But our friend Bob Schneider, who taught photography on the college level, sent the following one, which he took while the formal photos were being taken. It’s hard to imagine another image could be better. We’ve been promised our first detailed report on how Kyndall is faring on June 29. The arrival of that document is always exciting. In the meantime, my feelings of sadness have evaporated. I am confident Kyndall’s having fun. All sorts of good things are ahead for her. Saying goodbye to Kyndall yesterday was about as bad as we anticipated, for us, at least. And Kyndall didn’t look like she was having a whole lot of fun either. We left the house shortly after 9:30 a.m. and drove to the conference center in Oceanside where the graduation ceremonies are held. The first thing you do there with your matriculating puppy is to turn in his or her training gear and dress them in their ceremonial finery. Lots of photos get taken. Another big highlight was meeting the girl who will be Kyndall’s kennel-mate to start, Pendra, raised by a veteran Oceanside puppy-raiser. Dusty told us that Pendra was the calmest pup she’s ever raised — happy to wrestle and play for 15 or 20 minutes, and then to settle down for a snooze. That’s exactly how we would describe Kyndall, so it gave me high hopes that the two will get along just fine. The ceremony itself began at noon and lasted for a full 90 minutes. As always, it was an emotional roller coaster. There was a video introducing the folks who will be receiving dogs. Of this graduating class, three would be working as “facility dogs”(including two who will be helping to calm crime victims). Two were being awarded to help out women in wheelchairs, and two were chosen to be “skilled companions,” part of a whole team assisting the disabled person. There were speeches and a slide show of images of the puppies turning in and other words and sights to touch the heart. Impressive line-ups of well-behaved dogs. After the ceremony, we headed out to the van and tried to feed Kyndall an early dinner, but she wouldn’t look at it. Then we drove to the CCI facility for the saddest moment of all. Unlike any previous occasion, on this day we were accompanied by our two videographer friends, Alberto Lau and Bob Schneider, who are working on a documentary about puppy raising. Bob captured what it looked like right at the end. Note that Kyndall did what has always impressed me (and made me feel a little better). She trotted off wagging her tail, and she didn’t look back. Every 3 months, CCI holds a formal ceremony during which fully trained puppies who have successfully completed their Advanced Training graduate to their lives in service. The other crucial part of each graduation program is the presentation of the puppies who are about to begin their Advanced Training. This is what we’ll do with Kyndall tomorrow: turn her in to matriculate on the CCI campus. We’ve gone through this 4 times before, with the first 4 CCI puppies we raised. (The fifth, Dionne, went into heat and thus could not participate in the formal ceremony.) But for some reason, we never before took advantage of something the southwestern regional headquarters staff offers before each graduation: a tour of the kennels for puppy-raisers who are turning in their pups. This time Steve and I signed up for that experience, accompanied by Alberto Lau and Bob Schneider, our two documentary filmmaking friends who are working on a movie about puppy-raising. We also took along Kyndall and Kora, figuring it would be good for both girls to visit the campus, since both will be spending a lot of time there. (Kora, however, being 6 months younger, won’t turn in until November.) We gathered at the front door of the Oceanside facility, where we found a handful of other matriculating puppies and the folks who had raised them. Only two were local; the rest hailed from Utah, New Mexico, Colorado. Leading the tour was Becky Hein, the recently promoted director of the puppy program. Becky has worked at the headquarters for more than a dozen years, including long service as a trainer. In addition to all her years of experience, she has a warmth and obvious dedication to the program and the dogs that made her a compelling guide to the compound. There’s a lot to see. We passed through the training rooms and the well-appointed grooming area. They even have special “drying chambers,” where newly bathed pups get blown-dried with warm air. It was a little startling to hear the cacophony of barking on the grounds. We work hard to discourage our dogs from doing any “alert barking.” But Becky shrugged off the noise, dismissing it as an idiosyncrasy of kennel life. Most interesting to me was the chance to see the actual enclosures where the dogs spend their nights and part of their days. While not exactly cozy, they’re spotless and reasonably spacious, with heated concrete floors and an inner and outer chamber. Almost every puppy has a roommate, and according to Becky, they spend a lot of time playing with each other. The question I’ve heard more than any other from non-puppy-raisers is, “How can you stand to give the dogs up?” I have several answers to that question. I point out that one can’t begin to think about puppy-raising unless one accepts that one will be taking care of someone else’s dog. I point out the obvious fact that there would be no service dogs without puppy-raisers, and if you believe that service dogs dramatically improve many people’s lives (as I’ve come to believe), you can draw inspiration and comfort from that. I also think the more you do it, the easier it gets. But maybe the truest answer, for me, is that I don’t think much about the Turn-in Days until they’re imminent. Then I start to feel sad. The day itself feels like an ordeal to me, miserable. And then it passes. Because Kyndall is turning in tomorrow, I’m feeling pretty crummy tonight. But I have to say: today, seeing the busy, well-structured, clean, and purposeful place where she’ll be living did make me feel a bit better.